The young of a mammal while still connected with the body of its mother. 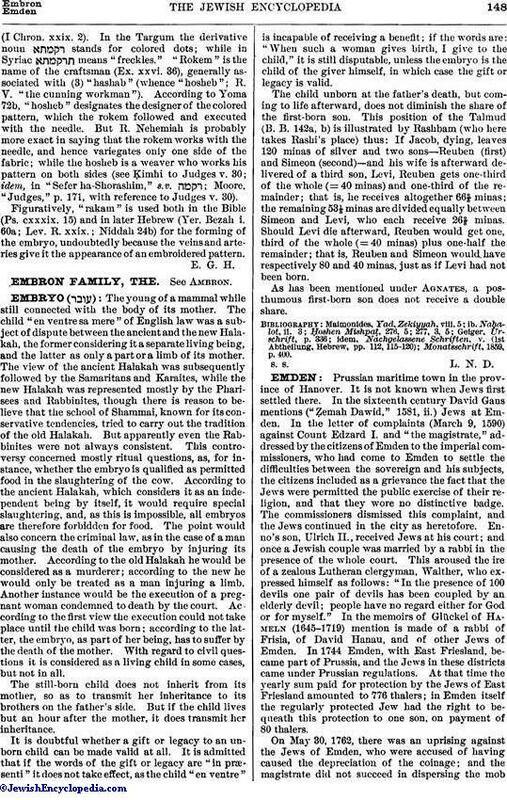 The child "en ventre sa mere" of English law was a subject of dispute between the ancient and the new Halakah, the former considering it a separate living being, and the latter as only a part or a limb of its mother. The view of the ancient Halakah was subsequently followed by the Samaritans and Karaites, while the new Halakah was represented mostly by the Pharisees and Rabbinites, though there is reason to believe that the school of Shammai, known for its conservative tendencies, tried to carry out the tradition of the old Halakah. But apparently even the Rabbinites were not always consistent. This controversy concerned mostly ritual questions, as, for instance, whether the embryo is qualified as permitted food in the slaughtering of the cow. According to the ancient Halakah, which considers it as an independent being by itself, it would require special slaughtering, and, as this is impossible, all embryos are therefore forbidden for food. The point would also concern the criminal law, as in the case of a man causing the death of the embryo by injuring its mother. According to the old Halakah he would be considered as a murderer; according to the new he would only be treated as a man injuring a limb. Another instance would be the execution of a pregnant woman condemned to death by the court. According to the first view the execution could not take place until the child was born; according to the latter, the embryo, as part of her being, has to suffer by the death of the mother. With regard to civil questions it is considered as a living child in some cases, but not in all. The still-born child does not inherit from its mother, so as to transmit her inheritance to its brothers on the father's side. But if the child lives but an hour after the mother, it does transmit her inheritance. It is doubtful whether a gift or legacy to an unborn child can be made valid at all. It is admitted that if the words of the gift or legacy are "in præsenti" it does not take effect, as the child "en ventre" is incapable of receiving a benefit; if the words are: "When such a woman gives birth, I give to the child," it is still disputable, unless the embryo is the child of the giver himself, in which case the gift or legacy is valid. The child unborn at the father's death, but coming to life afterward, does not diminish the share of the first-born son. This position of the Talmud (B. B. 142a, b) is illustrated by Rashbam (who here takes Rashi's place) thus: If Jacob, dying, leaves 120 minas of silver and two sons—Reuben (first) and Simeon (second)—and his wife is afterward delivered of a third son, Levi, Reuben gets one-third of the whole (= 40 minas) and one-third of the remainder; that is, he receives altogether 66⅔ minas; the remaining 53⅓ minas are divided equally between Simeon and Levi, who each receive 26⅔ minas. Should Levi die afterward, Reuben would get one, third of the whole (= 40 minas) plus one-half the remainder; that is, Reuben and Simeon would have respectively 80 and 40 minas, just as if Levi had not been born. As has been mentioned under Agnates, a posthumous first-born son does not receive a double share.